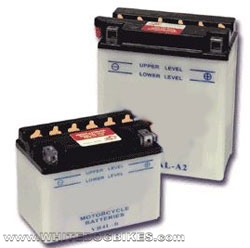 12 Volt lead acid or conventional motorcycle batteries can usually be distinguished by a row of plastic stoppers in the top (3 stoppers in a 6 volt battery and 6 stoppers in a 12 volt battery). Conventional motorcycle batteries reference numbers usually start with the letters YB, CB or GB (e.g YB14L-A2) or 12N (e.g 12N24-3). Where 2 battery references are next to each other with 1 set in brackets, For example YB9-B (12N9-4B-1), this indicates both batteries are the same.